Cytochrome P450 2B6 antibody recognizes cytochrome P450 2B6, also known as 1,4-cineole 2-exo-monooxygenase, cytochrome P450 IIB1 or cytochrome P450, subfamily IIB (phenobarbital-inducible), polypeptide 6. This antibody has been extensively validated for western blotting using whole cell lysates. Mouse anti Human cytochrome P450 2B6 antibody recognizes cytochrome P450 2B6, also known as 1,4-cineole 2-exo-monooxygenase, cytochrome P450 IIB1, cytochrome P450, subfamily IIB (phenobarbital-inducible) and polypeptide 6. Encoded by the CYP2B6 gene, cytochrome P450 2B6 is a member of the cytochrome P450 superfamily of enzymes. The cytochrome P450 proteins are monooxygenases which catalyze many reactions involved in drug metabolism and synthesis of cholesterol, steroids and other lipids. This protein localizes to the endoplasmic reticulum and its expression is induced by phenobarbital. The enzyme is known to metabolize some xenobiotics, such as the anti-cancer drugs cyclophosphamide and ifosphamide. Transcript variants for CYP2B6 have been described; however, it has not been resolved whether these transcripts are in fact produced by CYP2B6 or by a closely related pseudogene, CYP2B7. Both the gene and the pseudogene are located in the middle of a CYP2A pseudogene found in a large cluster of cytochrome P450 genes from the CYP2A, CYP2B and CYP2F subfamilies on chromosome 19q (provided by RefSeq, Jul 2008). 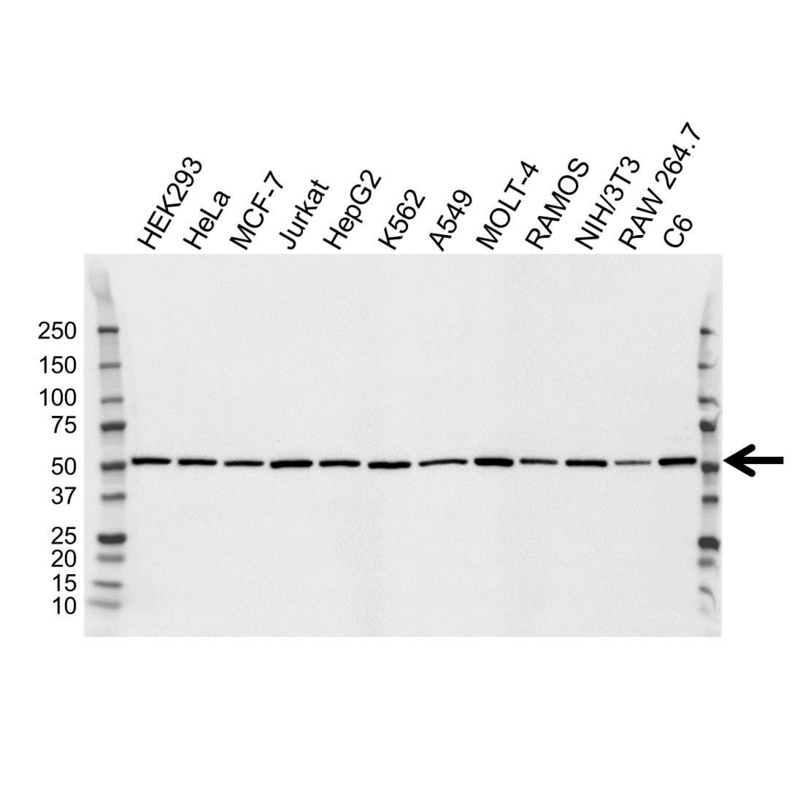 Mouse anti Human cytochrome P450 2B6 antibody detects a band of 56 kDa. The antibody has been extensively validated for western blotting using whole cell lysates. Anti cytochrome P450 2B6 detects a band of approximately 56 kDa in Jurkat cell lysates.